If you want to camp in a tent or RV near San Francisco and use your campground as a base for touring the city, options are somewhat limited. If you need a map, check the one at the end of this guide. These campgrounds and RV parks are the closest to the city, mostly just a few minutes' drive away. Angel Island: Angel Island is located in the San Francisco Bay, between Alcatraz and Sausalito and is reachable only by boat. Camping on the island is limited to just a few sites and tent camping only, but you'll wake up to a view of the whole bay! Candlestick RV Park: This is the closest campground to downtown San Francisco, located off US Hwy 101 south between the city and the airport, on the edge of San Francisco Bay. They have about 200 sites for RVs and tents and offer a shuttle bus to the city. San Francisco RV Resort: The next-closest alternative after Candlestick RV Park, it's not in the city of San Francisco but is just 15 minutes south in the town of Pacifica off CA Hwy 1. The campground is flat with paved sites, and pets are welcome. There are lots of RV sites with full hookups (except for the sites with a view). Treasure Island RV Park: Don't let the name fool you - it's not on Treasure Island, but it is close to San Francisco in Daly City. This mobile home park takes RVs only and has a handful of spaces for short-term stays. There's only one place to camp legally within the city of San Francisco. It’s located on four wooded acres just above Baker Beach. If you camp there, you’ll see the lights of Sutro Tower, smell the ocean, and hear owls hooting in the night. It sounds perfect, but there are lots of gotchas and time-sensitive procedures to reserve a spot. First off, it's only open from early April through late October. Each year's dates are posted on the Rob Hill website. RV camping isn't allowed. If you don't have camping gear, you can rent it from the Sports Basement at Crissy Field. There are only two camps at Rob Hill, set up for groups only. Each one can accommodate up to 30 people and comes with four parking permits. Each site has a fire pit, a free-standing barbeque grill, and picnic tables. Rob Hill has restrooms but no showers. The maximum stay is 3 nights. Reserve in early February for April, May, June, July and in early March for August, September, and October. Get prepared. Requests are filled on a first-come, first served basis. Payment is by credit card only and your camping fee is nonrefundable. Download their permit form. Wait patiently (or impatiently) for the download to complete. When it finally shows up, fill it out and have it ready. If you’re a Mac user, they say you’ll have to print it, fill it out, and scan. You will probably have to do the same thing from a mobile device. Weekends fill up fast. Have your finger on your email’s “submit” button, ready to send your application at 9 am PST sharp on the dates listed on their website. A minimum of three working days is required to process reservations. Even with a reservation, you need a contingency plan. Heavy rain or wind may close the campground. Alcohol is not allowed. The only pets allowed are service dogs. These places are all reached by taking US Hwy 101 north across the Golden Gate Bridge and an hour or less from downtown San Francisco. China Camp: On the shore of San Pablo Bay, about 20 miles north of the city. Some of the best weather in the area, with more than 200 fog-free days a year. They have no RV sites but do offer a few "en route" sites for self-contained camping vehicles. Kirby Cove: Few campers are hardy enough to put up with lugging all their stuff down (and back up) the steep, mile-long trail to this camping spot, but what a view if you do! It's practically underneath the Golden Gate Bridge. There are five tent sites in a grove of cypress and pine trees. Each site can accommodate up to 10 people. Kirby Cove is open from April through October. Bicentennial Campground: Located near Kirby Cove, it's the most accessible campground in the Marin Headlands, just 100 yards from Conzelman Road and the Battery Wallace parking area. Its three campsites are each suitable for one tent with up to three people. This primitive site has no running water. There is no fee for camping at Bicentennial. Marin RV Park: Self-contained RVs only, 10 miles north of the Golden Gate Bridge and a short walk from bus service to the city. Trailers allowed, but only if the tow vehicle never leaves the park. Mt. Tamalpais State Park: Spectacular views from the 2,571-foot peak about 20 miles north of the city. Limited camping sites are available and reservations are highly recommended. 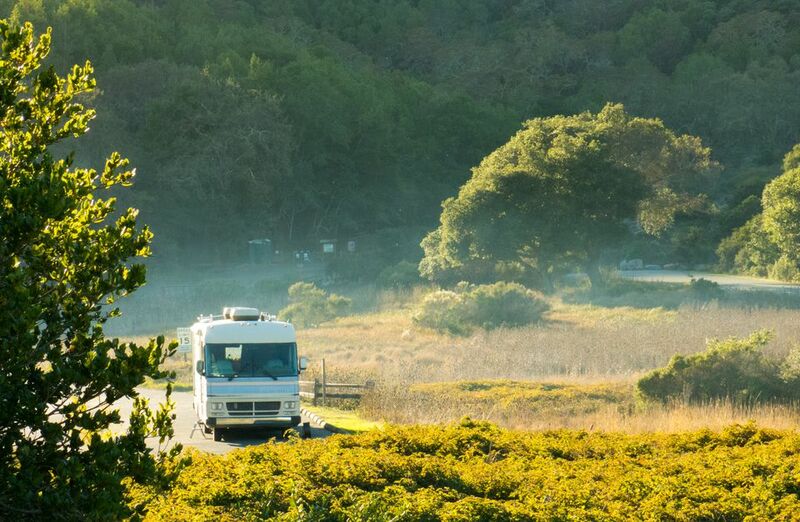 Novato RV Park: A privately-owned campground with 68 sites, 25 miles north of San Francisco. Pets are welcome, they have full hookups and a laundry room. Petaluma KOA: They call it "San Francisco North" but it's located 39 miles north of the city. This KOA has 300 sites with the amenities, including guided tours to San Francisco. RV and tent sites are available and they also have cabins for rent. Not as close to the city as other parks listed here, but worth a look if everything else is full. Mount Diablo State Park: The Bay Area's tallest peak offers a broad view that some say is surpassed only by that of 19,000-foot Mount Kilimanjaro in Africa. It's about 30 miles east of San Francisco, reached by crossing the Bay Bridge and going east. Tradewinds RV Park of Vallejo: A particularly good option if your trip includes Napa Valley, located about 30 miles north of San Francisco. Pets welcome, but no tents. You can get to San Francisco from there by ferry. You can also try Allstays' Walmart Overnight Parking Locator app to find the nearest store that allows overnight stays in their parking lot. These no-frills places (which do not provide water, electricity or a dump station) are best for self-contained RV camping. If you want to zoom in, get directions, and see what's where use the interactive map via Google.